The precise, cost-effective and compact circular saw with tilting blade for the D.I.Y. woodworkers and the small joiners. A great step up from the standard American-style cabinet saw. Compact chassis, powerful 4.8hp motor, and 5.5' sliding table. Will crosscut a standard 4x8 sheet on the slider or rip it lengthwise, using the rip fence to the right of the blade. Customers have put mobility kits on these and used them as job site machines. A proven performer. The new scoring unit can be supplied on request and can easily be adjusted from outside the machine. 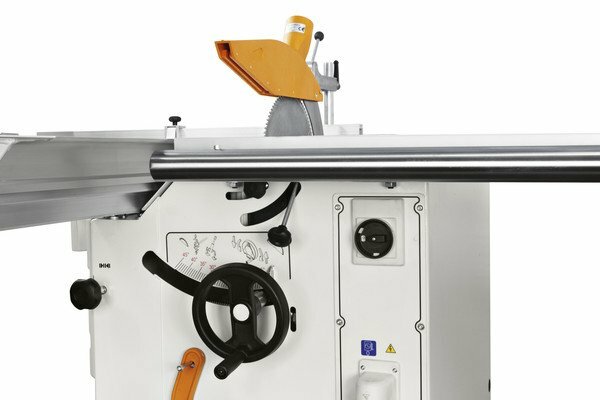 Easier and more precise cutting is possible due to a perfectly stable support that is guaranteed, even for large work pieces, bu the wide sliding table and the large squaring frame fence provided as st+W30andard. Top quality precision, smooth and silent action, self-cleaning dust-proof system, long lasting accuracy, no adjustment required. The table is made of extruded anodized aluminium with a closed honeycomb structure. The sliding table runs on an exclusive slideway system consisting of calibrated and hardened F550 SX steel guides.